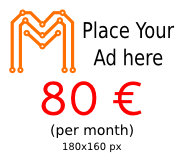 New website was started and you can test it. As you can see many things should be done. It is time to complete content of the existing articles and add a new ones. In the meantime the new versions of the articles from the old website will be added. If you have any remark feel free to write it in this topic. Currently, voltage inverters are used almost everywhere and very often replace traditional linear regulators, which for high output currents, gives a significant energy loss. Circuit described here is a simple Step-Down converter (12V to 5V) built based on the popular and inexpensive chip MC34063. The device is designed to work with 12V car installation, and can be used to charge/power GPS or mobile phones equipped with USB slot. In idle state the circuit is completely switched off and in normal operating conditions it can be automatically turn off when there are no power consumption at the output. The converter can be turn on, by a monostable switch, when load is connected to its output . This is 2-channel thermometer, which can measure temperature between -50.0 and +99.9 Celsius degree. Circuit is prepare to measure temperature inside and outside, but It can be also used in other applications. 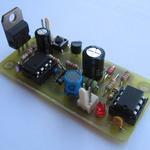 After the change of the source code it can be used as simple thermostat or more complex temperature controller. 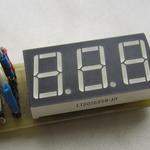 Device was build on the basis of popular digital temperature sensor DS18B20 and microcontroller ATTiny2313. Thanks to that this universal mini thermometer is much simpler to do and much smaller. All its parts were placed under LED display.